The House of the Dead (Notes from the Dead House) (Life in a Siberian prison camp!) - Kindle edition by Fyodor Dostoyevsky. Mystery, Thriller & Suspense Kindle eBooks @ Amazon.com. NOTE: This edition has a linked "Table of Contents" and has been beautifully formatted (searchable and interlinked) to work on your Amazon e-book reader or your iPod e-book reader. 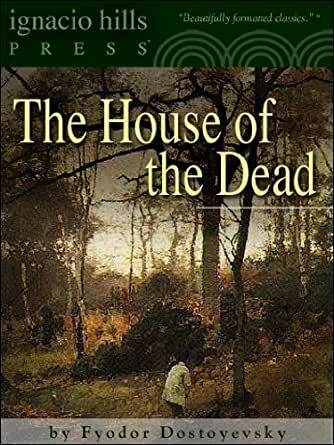 The House of the Dead is a novel published in 1862 by Russian author Fyodor Dostoevsky. It portrays the life of convicts in a Siberian prison camp. The author spent four years in exile in such a camp following his conviction for involvement in the Petrashevsky circle. This experience allowed him to describe with great authenticity the conditions of prison life and the characters of the convicts. The narrator, Aleksandr Petrovich Goryanchikov, has been sentenced to deportation to Siberia and ten years of hard labour. Life in prison is particularly hard for Aleksandr Petrovich, since he is a "gentleman" and suffers the malice of the other prisoners, nearly all of whom belong to the peasantry. Gradually Goryanchikov overcomes his revulsion at his situation and his fellow convicts, undergoing a spiritual re-awakening that culminates with his release from the camp. Dostoyevsky portrays the inmates of the prison with sympathy for their plight, and also expresses admiration for their energy, ingenuity and talent. He concludes that the existence of the prison, with its absurd practices and savage corporal punishments is a tragic fact, both for the prisoners and for Russia itself. FyodorÂ Dostoyevsky (1821 1881), one of nineteenth-century Russia s greatest novelists, spent four years in a convict prison in Siberia, after which he was obliged to enlist in the army. In later years his penchant for gambling sent him deeply into debt. Most of his important works were written after 1864, including Notes from Underground, Crime and Punishment, The Idiot, and The Brothers Karamazov, all available from Penguin Classics. David McDuff was educated at the University of Edinburgh and has translated a number of works for Penguin Classics, including Dostoyevsky s The Brothers Karamazov. Unlike the fictional works, Dostoyevsky's memoir reads effortlessly, the nArritive flows free of verbose philosophical meditations. The succinct style brings immediacy & illuminates his brilliant perception and powerful descriptive writing, filled with fine character studies, humanist values and pithy conclusions. As a MHP of prior immersive experience, Im moved by the accuracy of his ability to articulate truths transcendent of historical context. Nuanced Translation of culture of incarceration in tsarist empire. 1.0 out of 5 starsSave your money! This is just the LibraVox recording on MP3! This review concerns the MP3 audiobook version of The House of the Dead. Save your money, and don't waste your time. If you order this disk, what you will receive is an MP3 containing the LibraVox recorded version of the book, i.e., it is read by an amateur (rather than a professional) reader. Since the LibraVox recordings are available at several other websites for free, save your money. This is a description of prison life in a Siberian camp under the tsars. I was prepared to be depressed, as is so typical of Dostoevsky's stories, but found it quite informative. Prison life in that day was far less cruel than after the Bolshevik revolution & the advent of the Gulag. Published around 1861, this is a semi-autobiographical novel that portrays the life of convicts in Siberian prison camps, at the time of Tsar Nicholas I’s reign. Bleak of course, but as usual, Dostoyevsky gets to the center of the psychology of the characters in a clear and poignant way. It’s excellent and I recommend it. So...I am a big Dostoyevsky fan, so allow me to be just a bit critical here. I don't think "House of the Dead" is a good read for everyone. It significantly departs from the types of plot structures he uses in other novels. The reason for this makes sense--it was based on his own experience in Siberia, and was probably somewhat cathartic for him to put down in print. It is interesting if you want to learn more about prison life, but its not really a work of fiction per se with your typical plot structure. So just keep that in mind. Otherwise, Dover thrift is awesome. What a fabulous read! The semiautobiographical account of the author in exile. A microcosm of life set in prison. Shows man is man regardless of environment and character means everything. Demonstrates how different environments define honor and truth differently but true honor and integrity is always the path to self respect. Love this amazing novel! Life in a Siberian prison isn't as inhuman or as dead for Dostoyevsky as I had expected. Living in cramped quarters without proper plumbing and freedom restricted reminded me of my 2.5 years of full time conscription in the army. There was nothing like the dehumanizing solitary confinement of Edmond Dante in Count of Monte Cristo. Instead, 2 hundred prisoners were cramped into one building. Sure the night pail or waste tub sounded absolutely unbearable, but the opportunity to drink vodka, have a personal samovar to drink tea, gamble, play with dogs, have christmas parties, and working outdoors made the experience sounded more like a summer camp or kibbutz living. The author's frequent admiration of handsome looking young men suggested perhaps the author could be attracted to his companions in more than a platonic fashion. The silver lining to the incarceration was the rejuvenation of Dostoyevsky soul into a man of humility and anpathy after five years of introspection, refinement and coexistence with people from all walks of life. 4.0 out of 5 starsExile in Siberia. Published in 1861, House of the Dead is a semi-autobiographical work based upon Dostoevsky’s exile to Siberia where he was punished with ‘hard labor’ after he was initially convicted to be punished by death by firing-squad for his involvement in the Petrashevsky Circle, a literary group which espoused ideas in opposition to Tsarist autocracies and serfdom policies across much of Russia. 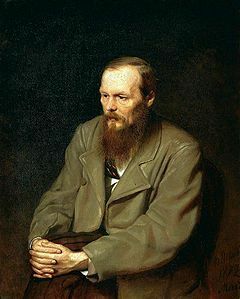 Dostoevsky spent four years in exile after his sentence was communicated and was afterward forced into the military until he was relieved due to poor health (epilepsy, it is believed). Following the story of Alexander Petrovitch and his exile to Siberia as a ‘nobleman’ (this causes no shortness of trouble for our protagonist) for 10 years once he’d surrendered to authorities after he’d murdered his wife. Dostoevsky gives special attention, and a substantial amount of it to the vodka trade. He reports that the guards turned a blind eye to the semi-aristocratic distinction of drunkenness because should they not: all would go wrong, later non-commissioned military personnel were brow-beating into operating the same way. The inmates found their own ways to keep the revelers in check, which would sometimes include tying them up and maybe even beating them to unconsciousness to avoid getting caught. There were many ‘importers’ of drink in the prison. They would typically sell and dilute and repeat until their supply was gone, then drink themselves under with what money they’d earned (yes, there was money available to the convicts). He also tells a story and gives a series of general prison characteristics for which dogs were abducted and had their hides tanned then used for clothing or other decorative purposes. Everyone had a graft, a hobby, a way to earn money. Legit or not, this is also discussed in much detail. Demographics: Civil class, Military class, in perpetuo and the Special section (which was mostly unheard of). Of many of the classes does Dostoevsky have stories to relate, generally with some bit of moral behind them, but most often presented simply as a witnessing of character or a series of related events. Dostoevsky also makes statement where the prisons could use reform toward a more humanitarian means and ends. Included are thoughts regarding: the importance of work, the need for some degree of leniency, the effects of perpetual degradation of a man’s soul, the need to recognize that the law is unjust and that ultimate reform will not be spurned through punishment and penal servitude. Holidays and religious ceremonies and their practices were permitted, even though the hand fell harder on the Mohommadians than it did the Christians. There are a few stories which regard Isiah Fromitch, the prisons sole Jewish inhabitant. During Christmas is expressed the good-intentions of the town folk in that they often offer many food-goods to the prisoners. Dostoyevsky makes clear to note that prisoners in Siberia were labeled ‘unfortunates’, and were generally, poignantly seen as such. The doctors in Russian hospitals are painted in a sympathetic air. Dostoyevsky does make note, though that the general Russian is fearful of doctors because of the horror stories they’ve heard from the operating rooms and the fact that they have ties to the governmental monolith. Within 3 chapters regarding the hospital there are also notes regarding reasons for going to hospital. One of the primary reasons is that the prisoner has undergone corporeal punishment, under the rod ‘on green street’. Upwards of 1000 strokes with a sentence deferred until ones health improves. Another common reason was febris catharalis, or simply for a rest from the labor. The doctors, very sympathetic to an unfortunate, would list the fictitious disorder a – febris catharalis. Dostoyevsky also alludes to his experiences concerning the prisons slim, but present, mental health cases, and the primitive remedies employed to assist them. Overall an interesting read and recount of some of Dostoyevsky’s exile experiences as a ‘nobleman’. Seen and erased are varying degrees of classism, and Dostoyevsky does a splendid job attempting to erase those lines and making equal the men who’s fates are tied together by misfortune.